Michael Burgess and Laurie Evans smashed 81 in a six-and-a-half-over stand for the fourth wicket to set up Sussex with a 36-run win in the Vitality T20 Blast opener at Chelmsford. Burgess, having his first T20 knock for Sussex, finished with five sixes in a 23-ball 56, while Evans’s 61 took 45 balls. The Sharks’ 181 for six, after electing to bat, looked slightly under-par, but David Wiese ripped the heart out of the Eagles batting with five for 24, including three wickets in five balls in his fourth over. Varun Chopra led the chase with 64 from 48 balls, including three sixes, but his exit sparked a late collapse with the last five wickets falling for two runs in eight balls as Essex finished 36 runs short. 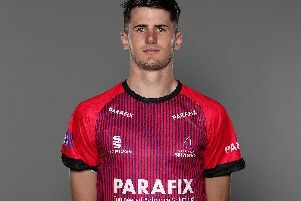 Luke Wright counts Chelmsford as one of his lucky grounds – having hit 153 not out four years ago – but lasted just two balls this time, cutting the first backward of square for four before being beaten for pace by Jamie Porter. The seamer had a second when Phil Salt pulled him to the midwicket boundary where Matt Coles took the catch above his head. Essex’s overseas signing, Australian leg-spinner Adam Zampa, was down on one knee imploring for lbw against Tom Bruce with his second delivery, but nailed the New Zealander two balls later when his next appeal was successful. The Sharks were 36 for three, but Burgess joined Evans and the pair had advanced the score by fifty inside four overs. Burgess reached his half-century from just 20 balls, with three fours and five sixes, the majority of them straight down the ground. Coles bore the brunt of Burgess’s assault, his first two overs going for 32, as the middle overs cost the Eagles dear. But on 56, Burgess landed a full-toss from Sam Cook into the hands of sub fielder Dan Lawrence at wide mid-on. Laurie Evans was less demonstrative, but reached his fifty from 36 balls before lifting Coles to Simon Harmer just inside the rope at extra cover. Jofra Archer played an entertaining 18-ball cameo at the end for 24, hitting Ravi Bopara for six over long-leg, and falling on his back as he turned Coles from outside off-stump for four to fine leg. He found himself lying on his back again but with partner David Wiese staring down at him, and was run out by Bopara’s spin and direct hit to the non-striker’s end. Archer made amends in his first over, having Adam Wheater caught pulling at deep midwicket, but in his second over was dumped over point for six by Chopra. Essex had just passed 50 when Wiese claimed two wickets in four balls with Tom Westley bowled and Ryan ten Doeschate caught behind without scoring. Rashid Khan accounted for Bopara when Phil Salt took the catch at midwicket, but Chopra punished him next ball with his third six of the night over long-off. His fourth four, caressed through the covers, took Chopra to his fifty from 36 balls and Essex past 100 in the 14th over. However, the rate was rising. It started at just over nine, was 11 at halfway and 13 with five overs left. When Chopra went, playing on to Khan, the situation looked terminal. Ashar Zaidi showed some resistance, hitting Will Beer for six to cow corner, but became Wiese’s third victim to Ollie Robinson’s third catch. Two more wickets in his last over gave Wiese his five-wicket haul. Coles went first ball when he pulled the ball to Bruce on the midwicket fence, and then Zampa played over one and was bowled. Archer sent Harmer on his way with his stumps splattered before bowling Cook with two balls left.